Garage Doors and Openers | Bouma Bros. Sales and Service Inc. If your garage door isn’t working as well as it should, call us today. Our technicians can repair your door without delay. Our experts are trained and certified to make sure your door is installed perfectly the first time. Having the right garage door will increase the value of your home. Only Garaga does it right! Welcome to Bouma Bros. Sales and Service Inc. We specialize in residential garage doors, including new construction. We have been family owned and operated for over 50 years. We are now the third generation of garage door experts proudly serving our customer in Grand Rapids, Michigan. You can count on us to continue our tradition of excellent service. At Bouma Bros. Sales and Service Inc., we recommend GARAGA garage doors. Their quality is unrivalled in the industry. Garaga doors are energy efficient, and offer a high R‑value to keep the cold Michigan winters out – a feat no other brand can accomplish. Please visit our image gallery to see our wide range of garage doors. We are happy to serve you in in person, by telephone or online. To see our beautiful doors, please visit our showroom, located at 1529 Burlingame Ave. SW, Wyoming, MI, 49509. You can also call us at 616-452-4704, or get a free online quotation for more information. For your convenience, we offer free in‑home consultations. Installing a garage door system requires training and expertise. To make sure your garage door is installed properly, contact Bouma Bros. Sales and Service Inc. As Garaga Experts, we will ensure the installation, repair and maintenance of your garage door is done correctly. Excellent customer care is our priority. That’s why we offer our customer quality workmanship in a timely manner. We work with residential, commercial and industrial customers, including new construction projects. In addition to new installations, we offer repairs and preventative maintenance programs for your existing garage doors. We serve the greater Grand Rapids, MI area. Call us at 616-452-4704, or come visit us at 1529 Burlingame Ave. SW, Wyoming, MI, 49509. Our hours are Monday to Thursday from 7:00 am to 5:00 pm, and Fridays from 7:00 am to 4:00 pm. Speak to one of our experts today and experience firsthand our tradition of excellent service. As for your new garage door system, don’t forget the door opener. Your garage door is the largest and heaviest moveable part of your home. A quality garage door opener makes your door safe and easy to use. It works hard so you don’t have to. At Bouma Bros. Sales and Service Inc., we turn to LiftMaster and Genie brand garage door openers to get the job done right. All of their openers come with several safety features, like sensors and automatic reversing systems, to keep your family protected at all times. They also offer a wide range of accessories, from lights to timers to state-of-the-art technology. We carry door openers for residential and commercial applications. For more information on all of our makes and models, please visit our door opener section. When it comes to curb appeal, choosing the right style of garage door can make all the difference. Is the style of your home modern or contemporary? Consider choosing the Standard+ garage door model by Garaga. Is your home more traditional, maybe in a Victorian style, or even country cottage chic? The Eastman or North Hatley doors would complement your home beautifully. To help you choose the right door for your home, why not try out our computerized Design Centre? With this program, you may upload a picture of your home and try out the garage door you select. In just a few clicks, you can try different garage door models, colors, windows and more! Once you like what you see, we can give you a free, no obligation quote. Our online Design Centre is quick and easy to use. Try it from home, or come into our showroom where one of our design experts will be happy to guide you through the process. About Bouma Bros. Sales and Service Inc.
Who are we at Bouma Bros. Sales and Service Inc.? 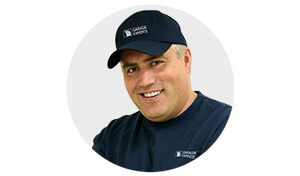 Your GARAGA Garage Door Specialist in the Wyoming area.